Digital UK has told TechRadar that its approach to the digital switchover makes it significantly less trouble to implement than the United States' switch, which has become mired in controversy and delays. The US senate had voted to extend the deadline on the digital switchover after it became clear that people were not prepared for the analogue switch-off. But Digital UK, the organisation looking after the UK's move from analogue television signals to digital services, is confident that their rolling region-by-region approach is on track and 'progressing well'. "The UK switchover programme is very different to that of the US," a Digital UK spokesman told TechRadar. "Switchover in the UK is based around a phased timetable, agreed in 2005, which will see analogue terrestrial TV signals replaced with digital services on a region-by-region basis between now and 2012. "It also has a fully-funded communications and help scheme programme. The US plans to switch on a single date and its help scheme is based around a voucher system." Digital UK has already overseen the first major switch: a small pilot in Whitehaven. The Borders region in Scotland has also been successfully shifted onto a fully digital television platform. "We monitor preparations for switchover in each region very closely and the 14 switchovers in 2009 are progressing well." 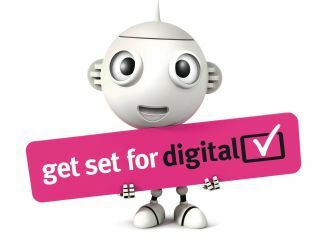 Digital UK feels that it's face-to-face advice and assistance for viewers that are key to any nation's digital switchover. "The terrestrial-heavy nature of the UK's television landscape makes it a little different to the US, which tends to boast a higher take-up of cable and satellite services," said the Digital UK representative. "This said, there are commonalities and our experience of switchovers in Whitehaven and Scottish Borders has shown that early engagement with the local community, strong support for the retail sector and the offer of face-to-face advice and assistance for viewers at the time of switchover, either at help centres or through the Switchover Help Scheme for those eligible, are key."